4 First Saturday - 30 degrees at 11:30 am. It really is too darn cold to fly! 15 Third Saturday - Today was certainly a beautiful day for going to the park; I'm sorry I missed it. But there was WACKOS representation at the park. See these photos as proof. "Turned out to be a pretty good day in Spartanburg – extreme winds that were forecast did not materialize there, the winds were intermittently strong and fading off to nothing, as is typical of a blustery inland day. I was able to fly a couple of Peter Lynn pieces in rotation, and there were maybe 100 people with small “toy” kites at various points of the day, keeping the sky well decorated. There were a surprising number of more serous kite hobbyists there as well, there were three sport kite fliers including a local fellow who was tricking pretty well, and fliers from Albemarle, Flat Rock and Atlanta with assorted nice pieces they lofted when the wind allowed. 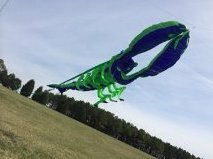 There was also a fellow who had just bought a Flowform 60, but I would be prepared to swear what he got in the mail was a 125 – in any case, it was his first large kite and he was excited to get a chance to fly it. The field was reasonably spacious, though on a hill – the wind would have been difficult if coming from about 180 degrees, but from the other 180 it was flyable – fortunately, wind was from a usable direction today. Organizers were very pleased with the turnout and with the event in general, and plan to do it again next year – so with luck, we may see a recurring festival there for some years to come. April 2014 is National Kite Month. 5 First Saturday - WACKOS "official" National Kite Month event. Bring your family, your banners, your wind garden, chairs, pop-ups and plenty of kites. Don’t forget drinks and something to eat. Let’s hope for the usual outstanding weather. Frank Liske Park is also holding a "kid-friendly" event with an Easter Egg Hunt and possible kite fly, among other events. Let's turn out and support our favorite flying park. More details as we get closer to the event. What a great day! And great turnout! As is usual at Frank Liske Park, the winds were up and down as were the kites but we managed to get some things in the air today. It was good to see so many WACKOS in one place again. 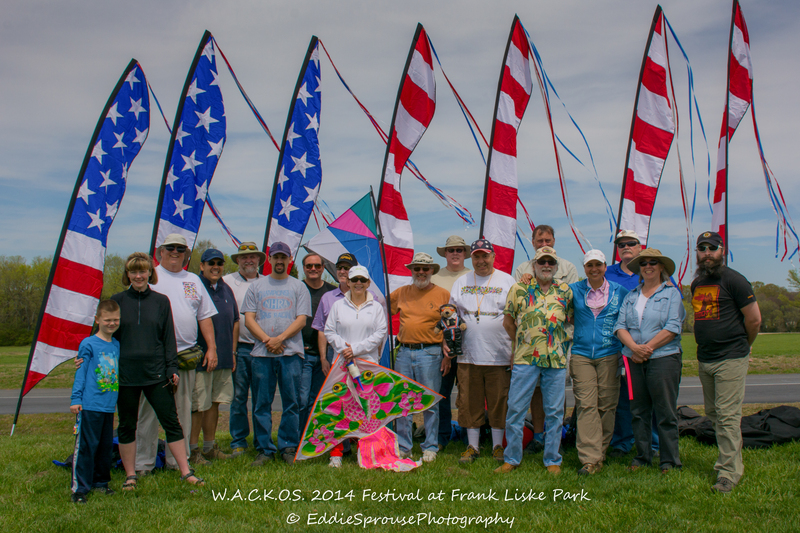 I hope we can get together again, either at Frank Liske Park (amongst the disk golfers) or another place suitable for flying. It's a shame that the park decided they needed a disc golf course in the middle of "our" flying field. Here's a teaser of the group picture that Eddie took. Click the photo to see his album of the event on Facebook. Enjoy! 5 First Saturday - Thanks to Arthur, we had some decent winds for a couple days - until today. Some disc golfers at Mint Hill Park were complaining the winds were going to make golfing difficult. Within a few minutes, the winds slowed to almost half of what they had been. And about 1:30 they stopped completely. Time to pack up and go home, so we did. I did confirm, however, that they don't want us on the soccer fields with the kites because too many people walk the track and it would be dangerous if they came down on them. From where I was near the volleyball court, there was no one walking the track, but I kept quiet because the "security" person was at least talking to me. He did give a couple suggestions for other areas that might be good for flying and I plan to check them out soon. So, typical inland weather is back with low to no winds. At least it wasn't as hot as it has been. 8 Cape Fear Kite Festival, Wrightsville Beach. Fly in front of the Shell Island Resort, website is http://www.shellisland.com.